Robert F. Burns wrote over two hundred letters home from 1941, when he went on active duty, to 1946, when he returned to the United States. His original letters were saved by his parents and sisters. Although a few of the letters suffered some damage from a basement flood, most were remarkably well-preserved. His sisters, Grace and Margaret, typed many of the letters with 5 carbon copies and shared those copies with more distant family members. Amazingly, even many of those carbon copies survive. The letters reproduced on this site are those he wrote between landing on D-Day+2 until he left Germany, covering his 300 plus days of combat. As an officer, he was careful to avoid writing about the actual fighting or even noting his specific location until those restrictions were loosened in 1945. As a result, his letters are filled with vivid descriptions of the countryside and the people he met. Since he was an artist, he looked at the world with an artist's eyes and his descriptions are often quite detailed. One letter amusingly describes his surprise about the conditions of bathrooms in French homes. He also wrote more serious, musing letters, perhaps when burdened by the horror of what he experienced each day. He wrote about the men he served with and their courage. He wrote of the men he admired and, in one interesting letter, described his new understanding of the difficult job of runners. As S-3 of the Third Battalion and later Asst. G-3 for the 90th Division, he interacted with men at every level and in every position, those famous and those not. Some of the letters indicate impatience and irritation about living conditions, such as the lack of clean underwear and the inability to keep clean. It is now generally understood that most of the men in combat suffered nearly continual diarrhea. The cause was unknown but lack of hygiene must have contributed to the misery. Finally, some of the letters speak wistfully of home and family and his regret at missing important family milestones. It was clear that letters from home and packages with special treats were so important. It was a surprise to find how quickly letters and packages went back and forth between Chicago and the European Theater. 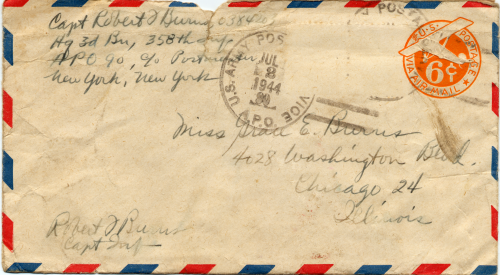 Most of his envelopes had the date noted when they were received in Chicago and he often commented in his letters when he had received a letter of a certain date or a package. Many letters were delivered just 5 or 6 days after mailing. That seems utterly amazing during a war. Most of the letters were written with pen or pencil on regular paper. Any VMail letters are noted as such. The letters here have not been edited. They were transcribed as written. 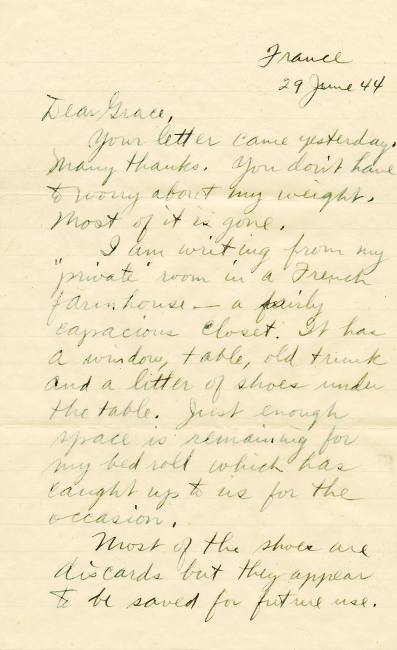 The following is the first page of an eight page letter he wrote to his sister in June, 1944. Although this letter was part of the group that had some water damage due to a basement flood, this multipage letter dried well.